Unusual Features: As a savant of forces, Damay has a number of unsual characteristics as a function of her Nola power. She is the most advanced of all the Kel'Varans and has the most control. Forces (including the force of gravity) have minimal effect on her unless desired. Damay has undergone leonization, or lifespan extension. She ages at about 1/100th the speed of a normal person. Magical Skills: While possessing incredible potential as a mage, Damay chose not to pursue magic in any depth. She knows enough magic to be dangerous however, capable of using 5th order spells when the need arises. As a savant of forces, using magic on her is almost pointless as she can easily absorb or redirect the energy. Tournament Rank: Damay has not entered a tournament in centuries. Her skills in hand-to-hand combat are excellent, easily 8th circle rank. They would be higher except she, like the Kel'Varans before and after her, relies heavily on her skill with thrown weapons. Her accuracy even under the most adverse conditions is nothing short of phenomenal-- able to place a dagger or dart in the eye of an opponent at over 30 yards. Her accuracy with a bow is equally impressive-- able to hit any target that she can reliably see (and reach with the weapon). Information: Eldest of the Kel'Varan's and reputed to be the most powerful. Damay fought many epic battles against Mandrimin (c.f.) the Ta'arthak Nola (savant of matter) in her time. About 6000 years ago she fell to Aarlen Frielos in a duel of magic, she was approximately 4322 summers old at the time. It is unknown exactly how or why, but Aarlen trapped Damay's tao essence in an amulet of shael-dal metal. It is surmised that the amulet was an experiment to create a magical item fueled by the essence of a savant. Apparently, the item was never completed. In 1091 N.I.S., Wren Kergatha came into possession of the amulet. She later resurrected Damay by rejoining her tao with a suitable body. Unusual Features: Dominique spent the majority of her life as a vampire. She has since been turned from vampirism, but still possesses the fangs associated with it. During an experiment on Kriar homeworld she was accidentally exposed to huge amount of chronal/gate energy. The result left her body partly infused with chronal flux. This makes her skin give off a soft glow visible as a dim aura at night. She is also a wielder of a Shaladen blade which altered her physiology even more. 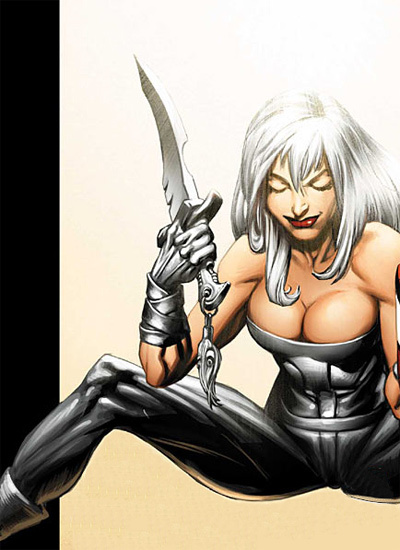 She wields a sword named Blackrazor that makes her the avatar of the Eternal known as Garn. Magical Skills: Dominique is a gifted lore-mage that trained extensively in battle-magic. While her magic is not as powerful as her mother's it is quite potent. Tournament Rank: Dominique is a highly skilled warrior that fights at the unlimited class level. 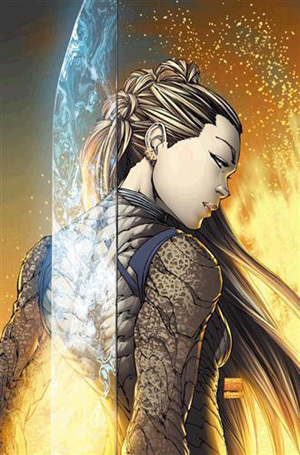 Enhanced speed, reflexes, and strength make her an awesome antagonist. Hardened in battle she can hold her own even against such opponents as Sindra and Drucilla Frielos. Information: Daughter of Gabriella Sarn Ariok and Sarok Ariok. 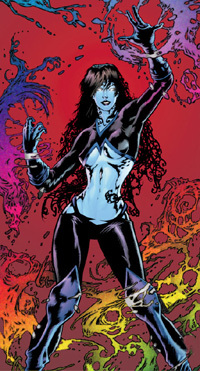 Like her mother Dominique was turned to vampirism to survive in the Silissian campaign against the servants of Kali. Dominique was trained from birth to be a warrior specializing in the destruction of the minions of Kali. She is a renowed blademaster and with her extended lifespan, she turned to magic and became a loremage as well. Unlike her mother, Dominique was not a willing vampire, she was forced into it by her mother. Centuries later when this condition was a removed, it remains a point of friction between them. (Ah, the drama of having an evil dragon-draining vampire for a mother!) As a result, Dominique was always closer to her father, who as one might imagine was no angel either if he took a vampire as his wife. Through a complicated series of events, Dominique attempted to free her mother after she had been captured by Dorian and Cassandra, and the evil purified from her. Not knowing what had been done to her mother, Dominique was quite surprised when her mother turned on her and assisted in her capture. Dominique too was turned from the darkness, and the vampirism that had been forced on her reversed. Many cycles later through a gradual campaign of persuasion, Dominique has slowly become friends with members of the Felspar clan. Though no-longer a vampire, she is still a 'vamp', and characterized by her smooth and lascivious dialogue, it goes without saying that she still likes whips and chains... but that's another story. For a number of cycles, Dominique and Tal Falor were an "item" and both did a tour of duty in the Shael Dal where the lady began to like the role of the hero. She and Tal split up on friendly terms in 1087 N.I.S. Dominique's exempliary contributions to the Protectorate were significant enough that she was asked to continue being a contributing member. It was through her involvement with the protectorate that Dominique came into contact with the Kriar high counsel Marna Solaris. She and the Kriar became fast friends in the wake of her recent seperation from Tal. Later, she and the Kriar lady became lovers. They eventually married when Marna underwent renewal. (Kriar periodically change sexual identity-- so Marna took on the identity of Marn--a male Kriar). Dominique has one child by Marna which she foathra'd when Marna was still female, a boy named Celaesh. Dominique has been teaching the Kriar matriarch magic, in return she has been learning Kriar warp-science and gate control. The woman's already formidable mastery of magic intertwined with Kriar super-technology make her one of the most dangerous creatures in the Ring Realms. Unusual Features: The latter half of Gabriella's life was spent as a vampire-- one that fed on the blood of dragons. She has since lifted those effects. She could not banish all of the physical characteristics. Her skin retains a scaley texture on close examination, and she retains the elongated incisors of a vampire. Being a mage of exceptional ability she can hide all of these facets. Magical Skills: Gabriella is a consume illusionist and practitioner of sorcery functioning far above the level of grand loremage. Her illusions and charms are particularly powerful given her nature as a vampire. The "kiss of the dragon queen" was an enchantment said to be so powerful that not even immortals could resist it. Tournament Rank: Gabriella, as a lady of breeding, would never engage in brutish hand-to-hand combat-- preferring instead to use magic to tie her opponents in knots. However, in her campaign against the thuggees of Kali Gabriella was a rough and tumble battle fury, draining the life of all who dared her claws. She is easily an unlimited class combatant when enraged, especially when she transforms into her namesake-- the dragon queen. Information: The Dragon Queen of Silissia. This great elder's true name (Drakka'Tah) is known only to a few. Gabriella was born sometime during the infancy of the Silissian old world, approximately 14,000 cycles ago. She was the sole survivor when the Kali cult over-ran her village and staked out her family. Swearing vengeance, she undertook a campaign against the followers of the death goddess that lasted close to five millennia. Early in her history, Gabriella turned to vampirism to get the strength and lifespan to continue her vendetta. Gabriella is known as the Dragon Queen because unlike typical vampires who feed on humans, her targets were typically dragons both for the amount of blood and their power. It is unknown how she gained the power to prey on dragons in such a fashion, but it surmised she gained this ability (curse?) from one of the three orbs of dragonkind. In her later years, Gabriella had the misfortune of crossing some of the Band of the Crescent Moon. After a number of clashes, the elder was eventually captured by the combined efforts of Dorian Degaba and Cassandra Kel'Ishtauri. With the power of grand magicks, Gabriella was turned from darkness to serve the light. Regardless of her new 'outlook', Gabriella is uneasy ally of House Felspar and the regime of Isis. After her 'conversion' Gabriella shared a close bond with Dorian, and two are fast allies. Dorian, along with her daughters Cassin and Annawen, serve as Gabriella's magical apprentices. Gabriella has four living daughters: Dominique, Gabrin, Sabella, Sarokirin. Her only son, Sarok, died in a conflict against her. Before her capture and conversion, Gabriella acted occasionally as an agent for Aarlen Frielos.